I think it is Philips because of the "Heat sinks" appearance of these lamps. The lamp contains 7 Luxeon Rebel(?) HPLEDs and produce 4000K light. They claimed to save 80% energy. But have only 40 lm/w (Less then T12 halophosphors). Lumen Efficacy: Barely 40 lm/w (CFLs have 65 lm/w)(Not efficient enough to light an entrie room). Is this can be called 80% energy saving??? Nice picture but it's not a Philips Led Spot (i have one at home and few at job) but another good price led lamp from China. In France we can found the same like yours by the Orbitec Brand. In their site, although the catalog is in PDF, i saw similar designs to this lamp. 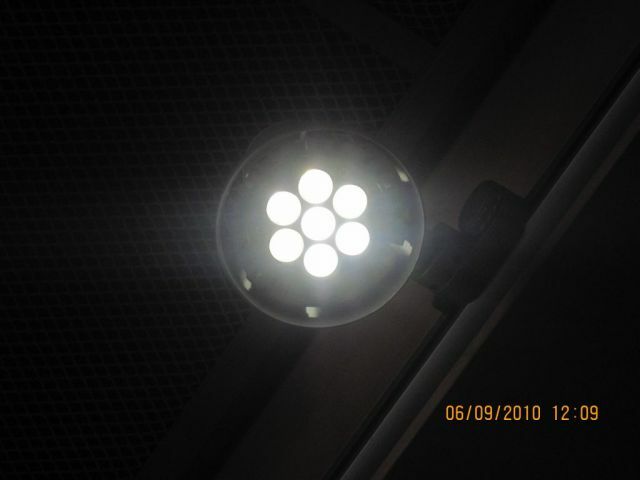 Also Orbitec is a known brand of halogen lamps and lamps for special purposes (Especially projection lamps) in Israel. Well, if a 55W incandescent lamp made the same 430lm, it WOULD be 80% more efficient. But that's really bad for a 55W lamp. Maybe one of those 10,000hr rated incandescent lamps would get that kind of efficiency.